MSNBC and CNN collectively gave nearly 5 hours more coverage to a Republican's arrest and indictment Wednesday than they gave to then-Rep. Chaka Fattah (D., Penn.) after he was indicted by the Department of Justice on similar charges, a Washington Free Beacon analysis shows. 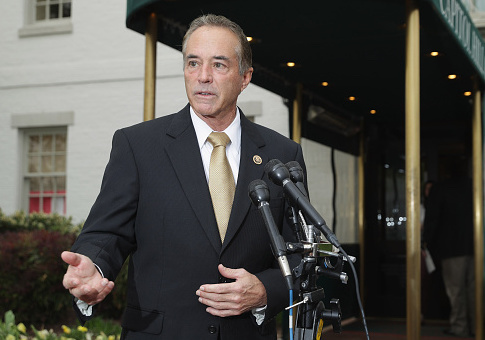 The two networks spent over five hours combined covering Rep. Chris Collins' (R., N.Y.) FBI arrest and indictment for securities fraud Wednesday. That is 17 times the combined coverage they gave to Fattah–19 minutes–on the day he was indicted by the Department of Justice for charges of fraud, bribery, and money laundering in 2015. News broke Wednesday morning that Collins had been arrested and was being indicted for securities fraud. In addition to the indictment, Collins' son and the father of his son's fiancée were indicted on charges related to insider trading. Collins' indictment was related to the Australian biotechnology company, Innate Immunotherapeutics, a company for which he served on the board of directors. In response to Collins' arrest and indictment, CNN and MSNBC heavily covered developments throughout the day from the 9 a.m. hour through the 11 p.m. hour. A Free Beacon analysis calculated that CNN spent 2 hours and 33 minutes talking about Collins compared to MSNBC's 2 hours and 56 minutes covering him. The calculations do not include Collins' press conference or U.S. attorney for the Southern District of New York Geoffrey Berman's press conference, which were both shown on MSNBC and CNN. Collins, who was removed from the House Committee on Energy and Commerce by Speaker of the House Paul Ryan (R., Wis.), said Wednesday that he would "mount a vigorous defense" to clear his name and that he would remain on the ballot in November. CNN spent 5 minutes and 17 seconds covering the breaking news of Fattah's indictment compared to MSNBC's 13 minutes and 48 seconds of coverage. Fattah would go on to be sentenced to 10 years in prison on federal corruption charges, including fraud, racketeering, and money laundering after being convicted on 23 charges. The 3rd U.S. Circuit Court of Appeals ruled Thursday that Fattah and an associate are eligible for a retrial on the bribery convictions that it threw out. Neither MSNBC nor CNN covered the breaking news of Brown's indictment on July 8, 2016 amid coverage of the ambush on police officers in Dallas a night earlier. In the summer of 2016, Florida Democratic Congresswoman Corrine Brown was indicted on 24 federal charges in connection to a "fraudulent education charity" she was running. At the time, the networks ignored it. And in May of 2017, when she was finally convicted on those charges, the three networks were also nowhere to be seen. The networks were also out to lunch when she was sentenced to five years in prison. This entry was posted in Politics and tagged CNN, Corrine Brown, Corruption, Media Bias, MSNBC. Bookmark the permalink.